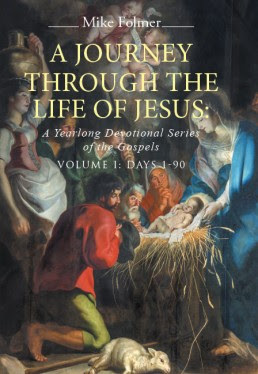 Volume 1 Days 1-90, this year long devotional is divided into four volumes. Because it is a daily devotion, and not a one pager, it is helpful that it is divided up into reasonable chunks so that you aren't having to lug around a dictionary sized book! Mike Folmer has put extensive work into this devotional. It takes a chronological look through Matthew, Mark, Luke and John about the recorded accounts of Jesus Christ. You can begin reading at any time, as it isn't marked for the calendar year. I always appreciate not having to match up the calendar date with what I am reading, especially when I am guilty of missing a day or two here and there. This allows me to pick up where my book mark rests and keep on the journey exploring the life of Christ. Each devotion is about 1.5 pages in length. Very easy read. There are scripture verses assigned that I recommend reading first. This is where the meat comes from, the Bible! After reading the suggested scriptures you can then read the devotional and get much more out of it. Don't skip reading the Word, that is what the whole devotion is centered on. After each devotion there is a ponder point where you are given a question to apply to your own life. There is typically half an empty page where if you are comfortable you can even make notes right in your book. This is an excellent devotional. Mike Folmer has some excellent, thought provoking devotions on the life of Christ. He brings new insight and 'food for thought' in reading some of what may be familiar words in the Bible. The Word is living, and I trust that you can glean much from the Word, and from this devotional.